There are several companies that offer custom books for your child by adding their name and/or picture. When I was a child, I still remember a friend had one, though they were rare then, and it was very sweet. I was a little bit jealous. Admittedly, I have always felt these personalized custom books a little bit off, as they often seem awkward as they work your child into the story simply by replacing a name, but I recognized their value. When my son was born, I felt it more authentic to actually write a book and a have my daughter illustrate it using photo book options on Shutterfly. Our was based on the Rainbow Bridge birthday story, and it turned out beautifully. Grandparents wanted copies. 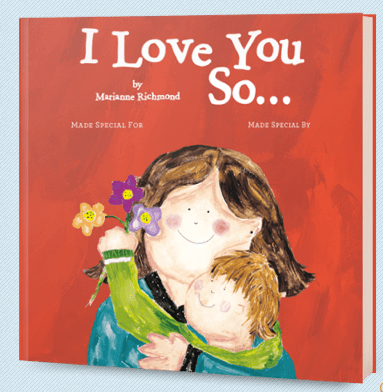 Personalize this bestselling children’s book that tells your child your love for them is forever! This fun, heartwarming book will bring a burst of sunshine for your child, especially when they see their name is inserted into the story. “You’re my sweetie, my dear, my smile and giggle. You’re my playmate for always, my hug and my wiggle.” This story will remind your child that even in the bad days, they are always loved—what more could a parent ask for? The process of personalizing this book when ordering was super simple. All I had to do was upload a photo, write a dedication, and include my son’s name. The book arrived quickly. My son’s reaction to this book was priceless. He thoroughly enjoyed our first reading and was delighted his name was on almost every page. I think he at first though I wrote the book for him, so I explained that in a way I did but that no, there was an author and illustrator (Marianne Richmond). The cover of the book does say “Made special by Mom and Dad”. My son was a little confused that on some pages there were pictures of girls with her mom or dad, instead of a boy like him, or that the hair color wasn’t always accurate. The illustrations do a good job of trying to cover different genders throughout, but it is definitely not multi-cultural. Perhaps a little bit more personalization would be better. In my experience, children need a little explanation of what the personalized book is, as my son’s expectations were a little high :)Once I explained that I did not write and illustrate the book, but that the book was special for him, he relaxed and enjoyed his name being present on every page. He especially liked the part about puppy kisses! Children like to feel special, and Put Me in the Story definitely does that! It would be best if the book was printed on recycled paper, as there is nothing eco-friendly about it.